﻿The last time we developed a new way of reaching orbit was back in the 1950s. How useful, then, to come up with one that allows huge weight reduction because it leaves propellant and energy source on the ground. Keeping the fuel at home or harvesting it along the way are key ways to conceptualize missions to the outer Solar System or beyond. But in more immediate terms, laser-beamed lightcraft can give us a relatively inexpensive way to low-Earth orbit as we begin to build a true space-based infrastructure. Eric Davis (IASA) and Franklin Mead (formerly of the Propulsion Directorate, AFRL, now retired and pursuing independent research) envision a ground-based laser beam generator system made up of power supply, laser beam generator/transmitter and related tracking, hand-off and safety systems. As we saw yesterday, the system would power an air-breathing pulsed-detonation engine that feeds off ambient air turned into plasma by the laser from the ground, producing a ‘superheated plasma shock wave (with instantaneous pressures reaching tens of atmospheres) that generates thrust in the direction of the laser beam.’ And we’re off, handing the thrust duties off to on-board propellant only when we climb above the atmosphere and switch to laser-thermal rocket mode. 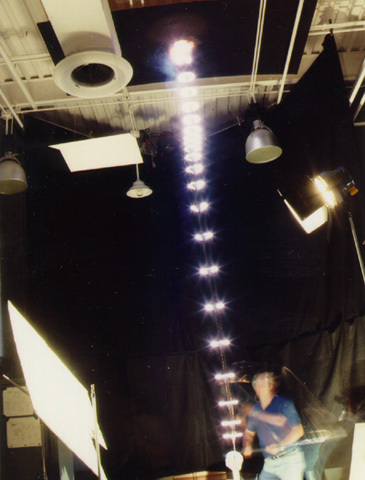 Image: A lightcraft test in 2000 at White Sands Missile Range in New Mexico. Credit: Rensselaer Polytechnic Institute. This achievement can be compared to the first successful flights of Robert Goddard’s liquid propellant chemical rocket, which attained a height of 12.5 m after a 2.5 second burn in March 1926. In sharp contrast with Goddard’s rockets, there is absolutely no fuel on board the prototype Lightcraft, which has a diameter of 10 cm, mass of 20-40 g, and is machined from a solid block of 6061-T6 aluminum. Five different Lightcraft designs have been flight-tested using the pointing and tracking system on the PLVTS laser. Current Lightcraft designs are limited to about 60 g mass and 15 cm in diameter by the PLVTS laser. A MW-class laser will be necessary for a kilo-class Lightcraft to reach orbit and components for these lasers exist, which would demonstrate the feasibility of this technology for low cost access to space. You may be wondering why Davis and Mead capitalize ‘lightcraft’ in the passages above. Eric tells me that the Air Force owns the lightcraft concept and capitalizes the word in its reports. In any case, the benefits of lightcraft are clear. We’re talking single stage to orbit (try that with chemical rockets! ), little on-board propellant (using the ambient air as the working fluid), and payload mass fractions running as high as fifty to ninety-five percent. We’re also talking about reducing costs by two to three orders of magnitude. The required laser beam power is 0.1 to 1 MW per kilogram of vehicle mass, and as the authors point out, “The ground-based MW-class laser beam generator is state-of-the-art technology.” The cost of generating the needed electrical power is $0.10/kWh, or less than $2 per kilogram of payload. These are powerful advantages over existing systems. Leik Myrabo, who has been at the heart of this research throughout the process, and who operates a company called Lightcraft Technologies, talks about propulsion concepts taking 25 years to mature. 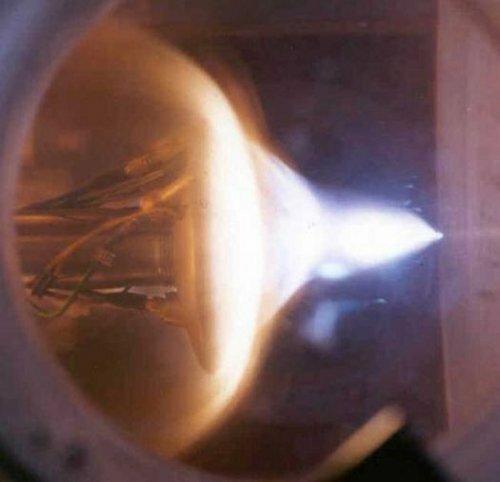 “That time is now,” he told Leonard David in this article, which notes that high-power laser experiments are in the works at the Henry T. Nagamatsu Laboratory of Hypersonics and Aerothermodynamics at the IEAv-CTA in Sao Jose dos Campos, Brazil, a joint effort betwen the US Air Force Office of Scientific Research and the Brazilian Air Force. Image: New lightcraft experiments are being conducted at Henry T. Nagamatsu Laboratory of Hypersonics and Aerothermodynamics. Credit: A.C. Oliveira and I.I. Salvador/IEAv-CTA. Myrabo holds the world altitude record for lightcraft in free flight, in an experiment funded by a grant to his company that attained an altitude of 71 meters. What we’re now seeing are encouraging developments in a technology that may soon achieve far greater heights, one that could by its economics drastically change our limited launch capabilites. As Myrabo told Leonard David, “It’s a matter of will and do we want to do it. This technology is now at the cusp of commercial reality.” For more, in addition to the Davis/Mead paper (citation in yesterday’s post), see Myrabo’s Lightcraft Flight Handbook, LTI-20: Hypersonic Flight Transport for an Era Beyond Oil (Apogee Books, 2009). ADDED: I see now that Myrabo is saying that the technology will take 25 years to mature. That seems more reasonable, but it begs the question about why he would be claiming a three-year time frame for 100km suborbital launches. Even at that height you’re talking about the possibility of launching science payloads high enough to do useful work, and taking another 22 years to full maturity after such a good start, doesn’t seem to be right. I think Myrabo’s 25 year comment was that it takes about 25 years on average for technologies to mature, and for lightcraft that includes all the work that’s been done up to now so they are nearing the 25 year mark. I’m reading Myrabo’s book right now. I think his estimate of 25 years for the technology to mature is reasonable, given that there are a lot of new technologies that must be developed and integrated into the flight vehicle propulsion lasers (light and microwave). I think what he means by sub-orbital demonstration in 3 years is being able to do a sub-orbital trajectory of the sample flight vehicles that they are testing now. Not anything that would carry a sizable payload. His book is quite detailed. It’s going to take me a while to get through it all. Thanks for the second post on this, Paul. In the previous thread, there was a lot of discussion about how to stabilize the system. This is really not a difficult engineering concept. The central parabolic mirror could be gimbaled to allow it to increase or decrease the heating at a specific point around the radius of the engine. This would provide asymmetric thrust and allow the vehicle to actively stabilize itself. Both of these need to be complete prior to suborbital testing, it seems to me. This might be a system where once you’ve made it to 100 km, you can develop an orbital vehicle relatively quickly. None of the small models have gone particularly high. What is the current limiting factor? Laser tracking? Not to be a wet blanket, but remember that the electricity generating capacity in the US is about 1,000,000 MW. If it’s 1 MW/kg to boost objects into orbit, then any sizable launch industry based on Lightcraft (lightcraft?) would probably take up a pretty good fraction of that capacity. Because of the vehicle is running on atmospheric air warmed by laser. Orbital or suborbital vehicles will carry a onboard tank of some kind of gas. I could be wrong, but I don’t believe there’s been any field testing since 2000, and none of that was with active laser tracking. If you watch the YouTube clip linked in the previous thread, you will see that they actually had to dangled a “backstop” from a crane above the laser to prevent it from blinding any satellites that happened across its path, so that would have been the main limiting factor. I get the sense that while this technology is a really cool idea, this discussion is reminiscent of the hype that the space elevator concept got when Bradley Edwards published his famous paper a number of years back. Remember when their “launch date” was supposed to be 2020? Well now it’s 2030. At least the lightcraft doesn’t have quite the same showstopper as the lack of a suitable material for the elevator ribbon, but there still seems to be too many unproven technologies required for the lightcraft to know whether this will be a viable launch technology in 10, 20, or 50 years, if ever. Don’t get me wrong. I believe that this type of outside-the-box research is probably the most critical effort, long term, in kick starting our final, sustained expansion into space. A cheap, safe, and reliable LEO launch capability is at least half the battle. Whether that ends up being a lightcraft, a space elevator, rail guns, floating platforms, or whatever, it doesn’t really matter, just as long as we get there, and as soon as possible. congradulations for Brazil and USA! this for show for the world that my country Brazil, its not only football and carnaval,we have good scientist here,that doing a great job in science and tecnology! A really cool version of such a craft that might have interstellar capabilities might be one that would direct extremely intense laser light onto a reaction mass located behind the craft. When, the laser light flux density was re-amplified by a reflective surface, it would converge on a target and ionize the target. Now, if we can only heat such a target to 100 million to 10 billion degrees, and use some kind of electro-dynamic mirror to shield the space craft from the hot plasma. Such a system would loose efficiency as the craft velocity approached C relative to the Earth. Another configuration would entail a distribution of such target masses around the ship, whereupon the ionization of such targets, the craft would use electro-dynamic-hydrodynamic-plasma drive systems to react against the plasma so produced. Truly, any further development of such a light craft by the AFRL, NASA, and Brazil is important. I am honored and pleased that my country, the U.S., has an opportuinity to work with Brazil on this light craft project. 12.5m in 1926, Goddard managed 610m by the end of 1930, 4 years later. Light craft on the other hand, has gone from 43m in 198? or 199? to 71m now in 2009? I believe the comparison is a little loaded/hyped. Someone correct me if I’m wrong, but wouldn’t that take up horrific amounts of power to scale up for regular satellites? Back of the envelope and by no means guaranteed to be accurate, but it seems a ten ton satellite at 50% payload fraction would require up 2-20 gigawatts of laser, which would require 10-100 gigawatts of electricity, or 1-10% of total US electrical generation capacity. A big “hear, hear” to Tacitus. This is all still very speculative, and in the best-case scenario we’re years away from having something that will probably be, at best, a supplement to existing launch technologies. Re Myrabo: experience suggests that when someone talking about space says “it is only a matter of will”, it’s not a good sign. One way around the potential power requirements short coming is to build a large series of rotating turbines that could be spun up to store vast quantities of kinetic energy. The turbines could be located in evacuated chambers and the kinetic energy could be converted to electrical energy via some sort of dynamo system. The mass of the turbine systems would be large but should be doable especially systems made of high strength stainless steels, carbon fiber composites, high strength Nylon, Kevlar, Graphite Aramid Composite materials, Spectra, and the like. Rotors have been tested with rotational velocities on the order of about 2 km/second and so I would not be suprised if such systems coupled with appropriate capacitor and inductors could provide a stable source of electrical power to operate the 10 GW to 100 GW lasers. The systems could be gradually spun up so as to not over tax the input power supplies. But if it was really that easy, wouldn’t NASA be investing a few million into the technology? I don’t know about NASA, but I would expect DARPA or some such agency to be investing in it. Suborbital flight would be enough for many of their purposes. What should we think about the efficiency of space craft propulsion by laser beam? 1. The laser beam will be interacting with the atmosphere. 2. It is an open question whether the longitudinal axis of the space craft will always be aligned with the laser beam (look at figure 2: light craft trajectory …). These effects will cause a loss of energy. If a laser beam with very great power is sent through the atmosphere, will we hear something like a thunder? Will people below be able to stand it? Bear in mind the the U.S. Airforce is developing a LASER Weapons platform based on a 747 Jet that will be able to keep a 10 MW laser beam focused on a missile until the missile fuselage burns through, melts, or is other wise weakened to the point at which it fails. A simple Google Search will result in numerous hits on this system. The system will destroy missiles in the atmosphere at a range of up to several hundred miles, and this is from a moving platform buffeted by atmospheric currents. I have no doubt that a laser beam can be designed to aim on the bottom of a light craft. I do not think that the sound will be any more harsh than that of a jet airliner and probably much less so. Even if it was as loud as the space shuttle, the prospects of low cost access to space would more than makeup for the diss-comfort. The American public got used to the idea that it might be incinerated at night by a Soviet Missile strike and so I am sure the novelty and effectiveness of any $2 per kilogram orbit insertion system would be a walk in the park by comparison. I certiantly would not mind watching the light craft be boosted into low Earth orbit by such a system. Remember, the futuristic missile defence program (or how it was called) at the time of president Reagan didn’t really work technically (but it worked very much impressing the Soviet Union thinking it lost the cold war, yeah). You say the laser weapons platform “will” do this and that, but in reality the U.S. Airforce is far from having something operative. I’m skeptical. I finished Myrabo’s “Lightcraft” book. It is quite interesting. The appendix is the best part, as it explains the background and the design philosophy behind the whole lightcraft concept. Myrabo should have made this the first chapter as it presents all of the engineering calculations behind the concept. It also explains much of the “why” that I was wondering about in the earlier part of the book. The lightcraft concept as depicted in the book is overly complex due to Myrabo’s presentation of it for all different kinds of military missions that require everything from high-g acceleration to covert hovering over enemy territory. I would like to have seen presented a simplified version of the lightcraft system designed specifically for space access, for people and cargo, as well as a breakdown of the envisioned capital and operating costs of such as system. Most readers of the book are interested in this concept for low cost space access. This should be presented more thoroughly in the book. Because of the over-engineering necessary to realize all of the military missions proposed, the lightcraft system comes across as a rather complex set of technologies that appear to be quite expensive for low cost space access. Also, the lightcraft concept cannot put large payloads into orbit. Heavy-lift launch vehicles are proposes for putting up the self-deploying SPS’s into space. I would like to have seen more commercial applications depicted for the lightcraft system. The emphasis of Myrabo’s presentation is more the esoteric military flight missions rather than on low cost space access. This is probably the biggest disappointment of the book for me. Overall, the book is quite good and I highly recommend it for anyone interested in these technologies and the problem of space access, in general. I think lightcraft technologies have a lot of potential and this book presents it quite well. Excellent to have your thoughts on this, kurt9, especially since I haven’t had the chance to read Myrabo’s book yet. Thanks! Here are some great links for the 747 ABL. I could include hundreds of additional quality links. I think the laser plane is much further along than you suggest although it will take atleast a few years to fully test, and refine, and perhaps a year or two, maybe more to deploy the first units. This is one beam technology to watch for its potential applications for space propulsion. I am personally fascinated by the COIL Beam. This is from New Scientist, 09/2009, — i.e. probably independent –, saying still no success and several severe problems. The Missile Defense Agency *plans* tests, the first later in 2009, two more in 2010. This is from Military Aviation News & Media, Cornell University, 10/2006, — i.e. probably independent –, saying “shoot-down test planned for 2008”. Well, they didn’t make it. This is from Boeing 09/2009, — interested party –, saying “The Airborne Laser (ABL) will” — will! — do this and that. I would say: Far from being operational. I’m still not impressed. Not wanting to be missunderstood: I hope they will get it. The relevance here is that in this year’s competition the climbers are powered by an 8kW ground-based laser. The beam needs to track a climber all the way up a 1km cable dangling from a helicopter. The teams do not appear to have had any problems in this regard during testing: “Once locked, the system is tenacious” (it was tracking a guy running around with the target 500m away). Beam tracking does not seem likely to be a show-stopper. Regarding payload size, surely if a system came online that could deliver 1kg masses to orbit extremely cheaply then the space industry would have a strong incentive to develop modular equipment? The cost benefits would justify a large upfront investment in Lego-like components that could be delivered to a conventionally-launched assembler satellite that had the ability to manipulate the components near each other in the right order. It wouldn’t even need to be particularly dextrous if the components could guide themselves together when placed close to each other using a tiny amount of propellant and magnetic couplings, just for argument’s sake. Just because satellites go up in one piece at the moment doesn’t mean we couldn’t adapt if the incentive was there. We feel the company is on the right track to reach the milestones even if it’s still too early to say if the technical challenges will all be overcome.